Slow juicers, also known as masticating juicers, have become quite popular in recent years. Their main appeal is that they are more efficient at producing the highest quality juice using the least amount of produce. And if you’re looking for a wheat grass juicer, masticating juicers are the best choice for this. 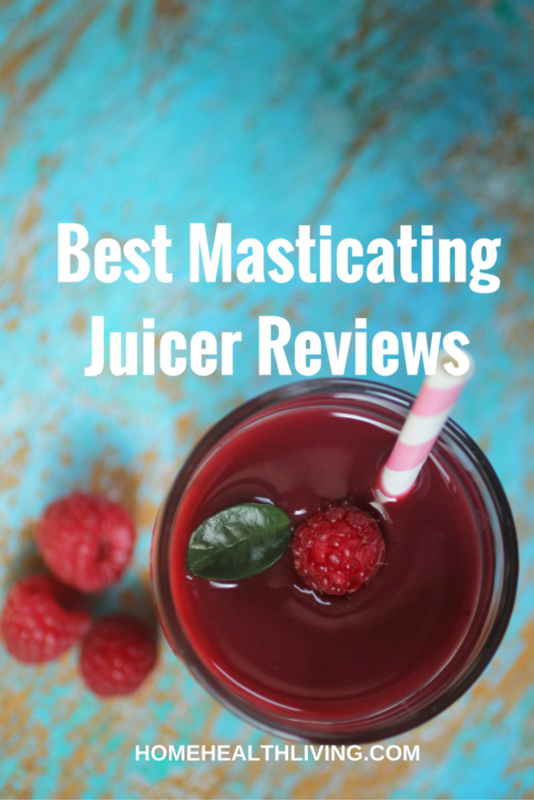 But not all masticating juicers are equal! There are so many on the market, it can be difficult to choose which one is the best. So I’ve made this task easier for you, by researching and compiling a comprehensive guide to the best masticating juicer on the market. 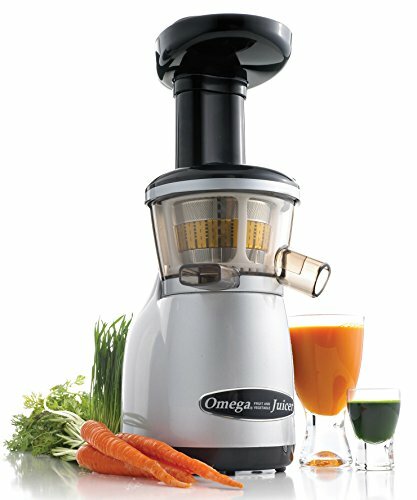 The Omega J8006 Nutrition Center Juicer is a popular best seller and an affordable masticating juicer. Its predecessor is the Omega J8004. Omega is well-known for creating some of the best masticating juicers on the market and is the best juicer for leafy greens. The J8006 is a single auger juicer with dual stages. Its auger is made of GE’s patented Ultem resin (plastic) which is said to be 8 times stronger than most other types of plastics. This ensures that the auger lasts longer and that it doesn’t become damaged or break down. Some consumers are concerned over the use of plastics in juicing because of possible leeching of plastics into the juice. The Omega J8006 auger has a low rotation speed of 80rpm, resulting in a juice that hasn’t been damaged by heat or oxidation. This means that the nutrients from the produce have been kept intact, even though the produce has been chewed, crushed and squeezed. Omega states that the juice can be stored for up to 72 hours with minimal oxidation. This is great for those who like to juice larger quantities of produce and store it in the fridge for easy access without having to juice every day. The Omega J8006 uses a dual stage processing system. The first stage involves crushing the fruits or vegetables, while the second stage involves squeezing the produce to extract even more juice. You are then left with a healthy juice that hasn’t been damaged by oxidation- it retains its nutrient levels, its color and flavor. Because the juicer runs at a slower speed, it has reduced foam and froth- nothing more off putting than a brownish juice with foam at the top! The juicer has an auto pulp-eject function that leaves you with a very dry pulp which is perfect for making cakes with. Those on a raw or vegan diet will be able to reuse the pulp in different ways. Reduction in food wastage is great for our environment. What I love about the Omega J8006 is that it is a versatile machine. If you’re investing in a good quality machine, you’d like to be able to make the most of it. With the Omega J8006, you are also able to turn nuts into nutritious and inexpensive nut butters– all-natural peanut butter tastes so much better than shop bought peanut butter with additives and other nasty stuff. Parents of babies will be happy to know that they can use the Omega J8006 to make baby food using healthy and natural produce. You can also use the juicer to make soy milk, grind coffee and spices, mince fresh herbs and garlic and to make soy and nut milks. 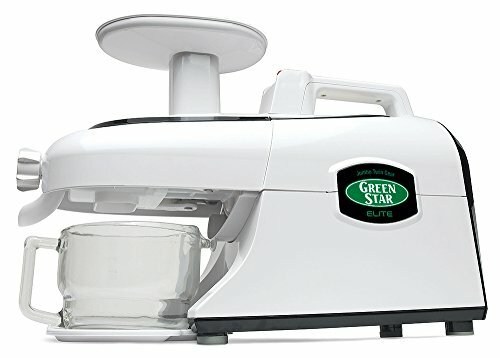 If you’re looking for a wheatgrass juicer, then the Omega J8006 is a great choice because it can juice wheatgrass as well as other leafy green vegetables that most other juicers can’t, such as spinach and kale. The design of the Omega J8006 means that it is a strong and durable machine that will last longer than a centrifugal juicer. Because the Omega runs at lower speeds, its components last longer than those of a centrifugal juicer. The motor operates at 150 watts. 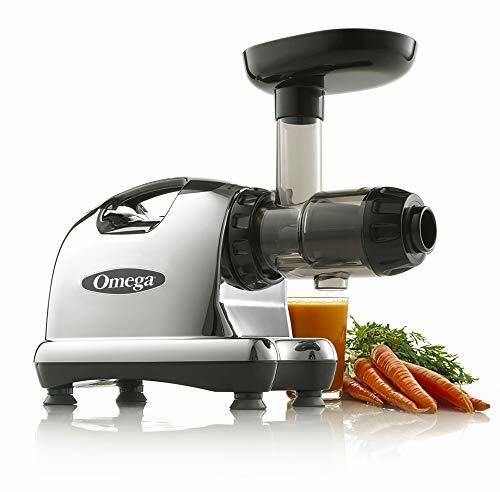 Even though the masticating juicer has four stabilizing feet, Omega recommends that you place the juicer on a thin towel to help increase stability and to reduce noise. There is a limited 15-year warranty available. Breville is a well-known Australian brand for juicers and other kitchen appliances. Most juicer brands focus on centrifugal juicers. The Breville BJS600XL is a single auger vertical juicer, which operates at a slow 80rpms. It is the only slow juicer that Breville manufactures. Unlike the patented GM resin used by Omega in the production of its augers, the Breville auger is made from painted plastic. Some consumers are concerned with the use of plastic in juicers, because the plastic make break down over time and leech chemicals into the juice during operation. 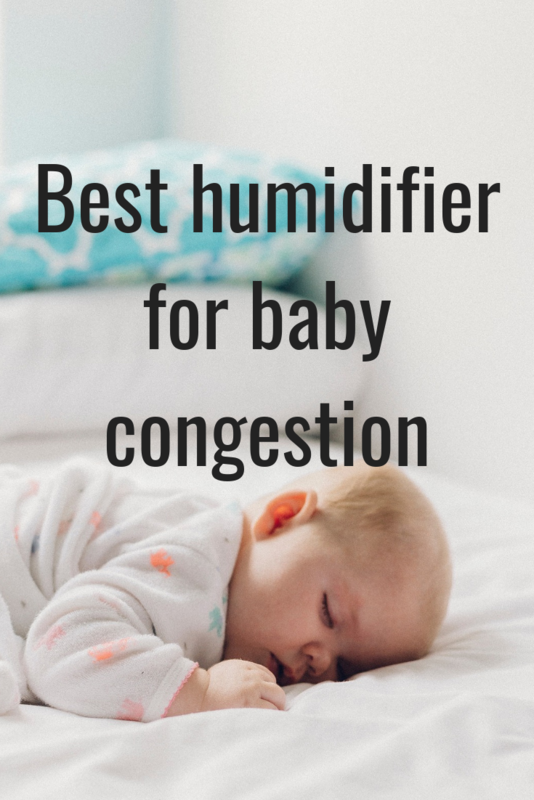 Other consumers do not find this an issue because the slow operation speed of the juicer means that this is less likely to happen than if you were using a high-speed centrifugal juicer. What impresses me about the Breville BJS600XL is that it has a two-step safety locking system. Before you can operate the masticating juicer, all parts need to be assembled and the lid must be locked in place. This is a great safety precaution in case someone tries to operate the machine before it isn’t ready. Another great safety precaution is if you overload the juicer with too much produce, the Breville masticating juicer automatically stops, which prevents overheating or damage to the machine. When people look for the best juicer on the market, they consider how easy it is to clean the machine. Cleaning up after making a juice can be such a pain and it’s what stops many people from using a juicer. The Breville BJS600XL features a reverse direction control button which allows the juicer to operate in reverse. This is handy for when you want to make sure that there isn’t any pulp still stuck in the machine. Breville also recommends pouring a glass of water into the machine in between juicing (while the motor is still running) to flush out any remaining bits of produce still inside the juicer. This helps make overall cleaning so much easier and quicker and you won’t need to pull the machine apart. Also included with the juicer is a cleaning brush to help you remove the pulp from the mesh basket. It has a handle long enough to be able to clear out any pulp stuck in the chute of the masticating juicer. There is a pulp bin that catches the pulp as you’re making your juice, and a juicing jug to catch the juice from the juicer. When compared with the Omega J8006, the Breville’s motor is noisier as it has a 240-watt motor compared with 150 watts. However, the Breville masticating juicer is much quieter than its centrifugal counterparts. I think the most disappointing part of Breville’s masticating juicer is that it only comes with a 1-year limited warranty. This is disappointing, considering that almost all other masticating juicers have a warranty of at least 10 years, sometimes even as high as 15 years such as the Omega. To be spending a few hundred dollars on the Breville product with no protection after 1 year of use is something to think about before making your purchase. The SKG New Generation slow masticating juicer has an improved design and features to maximise the amount of juice extracted from your produce. It is a vertical masticating juicer. Its 3-inch (76mm) “Big Mouth” wide chute is great for those who don’t like having to cut up fruits and vegetables into smaller pieces before using a juicer. This is a common complaint about masticating juicers- the produce needs to be cut smaller and so this takes more time and patience. But with a wider chute, you will save time. A larger chute also reduces clogging of produce which helps minimize cleaning issues. Feeding larger pieces of fruits or vegetables means that less of the produce is exposed to oxygen. The smaller the pieces of produce, the higher the likelihood of quick oxidation (think about cut up apples going brown quickly). The motor operates at 240 watts and the speed is a low 60RPMs, lower than most other masticating juicers on the market. According to SKG, the juicer has a high juice yield– oranges produce 85% juice, pears produce 78% juice, apples produce 65% juice, celery produces 65% juice and carrots produce 42% juice. These numbers give you an idea of which fruits produce the most juice. The strainer base and valve help seal the juicer so that during the juicing process, the juice isn’t exposed to oxygen. You can also make sorbets and tofu using the SKG new generation juicer. 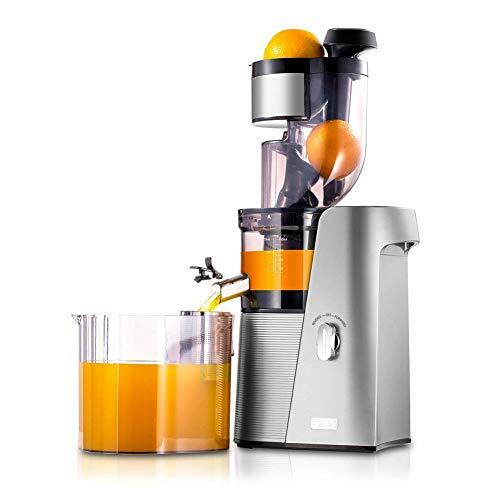 The juicer has components made of stainless steel as well as Tritan, which is a food-grade high quality plastic. 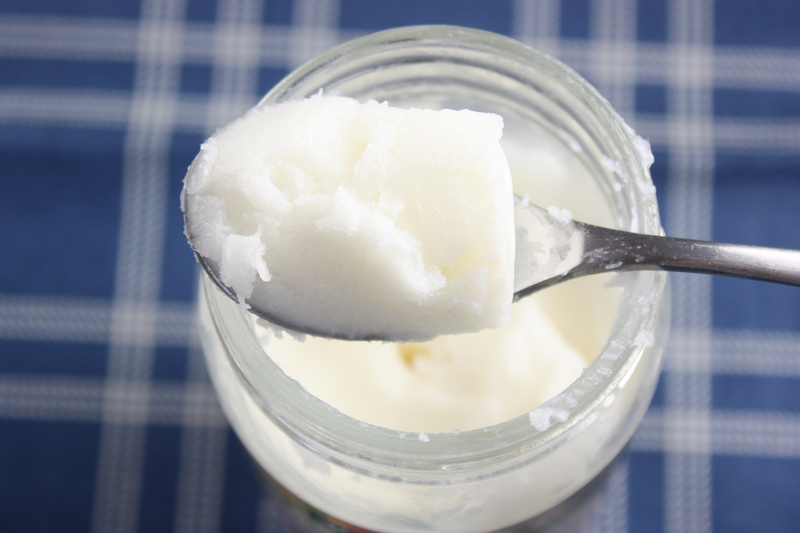 Tritan is BPA-free and BPS-free. It is ETL, CE and ROHS certified which means that it is qualified to be used in the production of food for human consumption. 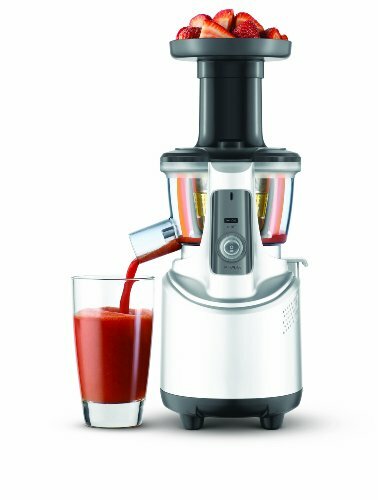 One of the things I really like about the SKG is that for Amazon customers, the juicer comes with a 1-month free trial and 2-year warranty for all parts and accessories. There is also an extended 10-year warranty available for the motor and main body of the juicer. The product warranties are automatically valid with an Amazon order ID. If you need replacement parts, they are also available at a heavily reduced cost from Amazon. The Tribest Green Star Elite GSE-5000 is an award-winning cold press slow juicer with two gears that is versatile and allows you to do more than just create fresh fruit and vegetable juices. The juicers augers rotate at 110RPMs and it has an automatic pulp ejection to allow the pulp to easily come out of the machine. This helps speed up the juicing process and makes it easier for you to clean up afterwards. The augers have been created using advanced magnetic technology, different from augers used by other juicers. There are magnets built into the augers so that when the juice is being extracted, it passes through a magnetic field which increases the alkalinity of the juice by enhancing it with potassium, magnesium and calcium. The stainless-steel augers feature special cutting points that mimic teeth, and have pocket recesses to help create a sharper edge. This helps with processing hard vegetables like carrots. The motor doesn’t have to work as hard to process carrots. Some other juicer motors wear out over time from having to extract juice from hard vegetables. The cutting points on the augers also help juice stringy vegetables like celery. To protect the twin augers and to prevent them from accidentally coming into contact with each other (and to prevent stainless steel shavings from ending up in your juice! ), the Tribest Green Star Elite comes with a nylon buffer that separates the two augers by about 4/1000th of an inch. This stops the twin augers from coming into contact even when they are rotating at their maximum speeds. The magnetic augers and the slow RPMs combine to reduce the level of oxidation of the juice. What this means is that you can create your juice in the morning and take it with you to work and it won’t oxidise quickly like juices made from centrifugal juicers. You can juice a large quantity at a time and store it in the refrigerator for a few days without changing the nutrient levels. No brown juice here! The Tribest Green Star Elite was designed to be able to juice leafy green vegetables, which we know contain the highest levels of nutrients. If you’re looking for an effective wheatgrass juicer, then the Tribest Green Star Elite would be an excellent choice. You’ll be able to easily create healthy green juices from leafy green vegetables. What impresses me about the Tribest is that it goes beyond just creating juices. It acts like a food mill as well- you can grind nuts and grains, make sorbet, nut butters or even baby food. If you’re the kind of person who likes a versatile machine rather than having to buy a new machine for every different process, then you’ll like the Tribest. The juicer also has an adjusting knob to use when you are juicing soft fruits such as oranges or tomatoes. You can adjust the pressure of the juicer when juicing different types of produce. This is handy because different fruits and vegetables require different levels of pressure for maximum extraction. By adjusting the pressure, you are helping your machine work as efficiently as possible without damaging it unnecessarily. Having two augers/gears means that the Tribest juicer has a full mastication system. This means that the juicer can behave in the same way that our own mouths and teeth behave when chewing on food and breaking it down. Its complete functions mimic how we cut, slice and chew food using all our teeth and not just our molars. This helps to break down the fruits and vegetables properly so that we can digest them and our bodies can easily absorb the nutrients. Most other masticating juicers only focus on the chewing function when breaking down the produce. These juicers do not mimic the functions of slicing and cutting. Tribest compares those juicers with people only chewing food with their molar teeth. Included with the juicer machine are four different screens. You can choose the screen depending on the texture of juice that you want. If you want a juice with minimal pulp, you can use the fine screen. There is a coarse screen if you prefer a pulpy juice instead. There is also a homogenizing blank for basic food processing. If you want to make raw breadsticks and rice cakes, there is a breadstick maker set. If you want to use your Tribest machine to make pasta, you can covert the juicer into a pasta maker by purchasing the additional pasta maker set. Included with your juicer is a glass juice pitcher, a wooden and a plastic plunger and a cleaning brush. As I mentioned earlier, the Tribest is an award-winning juicer. It was a Grand Prize Winner at the 1993 International Invention New Products Exposition; a Silver Medal Winner at the 1993 International Exhibition of Inventions in Germany; the Korean President’s 1st Prize at the 1993 Invention Day in Korea and was a Silver Medal Winner at the 20th International Exhibition of Inventions in 1993 in Geneva, Switzerland. The Tribest Green Star Elite is also portable and easy to move around. It has a grip handle that makes it easy to carry. It comes with a 12-year warranty. The Omega VRT350X slow vertical masticating juicer has a single auger that rotates at a low 80RPMs to prevent the oxidation of your juice. There is reduced foam and froth and you can store your juice for up to 72 hours without oxidation damage. The juicer uses a squeezing function rather than a grinding function like most centrifugal juicers. The VRT330S has a dual-stage juicing system, which means that the produce passes through two different stages to extract the most juice. The first stage involves crushing the produce to extract maximum juice. The pulp is then squeezed during the second stage to extract any remaining juice, leaving you with a drier pulp. There is an automatic pulp-ejection function that allows the pulp to be easily removed from the juicer. This prevents clogging and problems when cleaning the machine after use. There is also a reverse function, which allows you to run the juicer in reverse motion to dislodge any pieces of produce still stuck inside the juicer. It has an auto cleaning system making it easy to use and to keep clean. It wipes the screen during the juicing process. You could also add an additional step and flush the juicer with a glass of cold water to ensure there aren’t any pieces stuck inside the juicer. The parts of the juicer are removable and are dishwasher safe. It comes with 1 fine screen only to produce pulp-free juice. The Omega VRT also comes with a pusher to help you push the produce through the juicer. The motor itself has a 1/5 horsepower-equivalent single-phase induction motor which means that the motor runs on lower power. This makes it quieter- no more waking everyone up in the morning when you’re using your juicer! What’s so great about a vertical juicer? Being a vertical juicer, the Omega takes up less counter space making it perfect for smaller kitchens. It is easy to assemble and to move. But in terms of the impact on the quality of the juice, I couldn’t find any information that confirms that a vertical juicer produces better quality juice than a horizontal juicer. Some may say that there is a difference, I don’t believe there is. Whether you choose a horizontal or vertical juicer is a personal choice. Omega does have a patented screw design for its auger which makes it more efficient when going through the dual stage process of squeezing and pressing the produce. There is a limited 10-year warranty. A masticating juicer, also known as a cold press juicer, is a juicer that uses slower speeds to extract more juice and nutrients from fruits and vegetables. Masticating means to chew, as in to chew food. A masticating juicer uses a similar process to how we chew our food. The juicer chews up the fruit and vegetable fibers and plant cells, which results in a juice with more minerals, vitamins, and enzymes. Masticating juicers contain an auger that pushes the produce through the machine. A dual stage juicer uses two stages to extract the juice from fruits and vegetables. During the first stage, the auger crushes the produce, which extracts juice. The second stage involves the auger squeezing the pulp through a fine stainless steel mesh to extract even more juice. The pulp and the juice are separated during this process. This results in a larger quantity of juice being extracted, and a drier pulp. The great thing about this is that you will get the maximum amount of juice available from your produce. More juice is produced from less produce. There is also less wastage. This makes a masticating juicer more efficient than centrifugal juicers. Centrifugal juicers simple spin the produce around at high speeds to help break it down. A masticating juicer can also extract juice from leafy green vegetables and wheat grass, something that other juicers struggle to do. A disadvantage of masticating juicers is the higher upfront cost. They are more expensive to purchase. 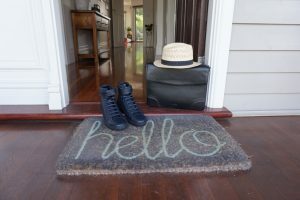 However, you need to weigh up the initial cost with your overall savings in the long run. You will be using less produce to create the same amount of juice as a centrifugal juicer. They are also much heavier than a centrifugal juicer. They are not a great option if you require something that is portable. A slower speed means a reduction in froth and foam, and a reduction in oxidation. Oxidation is when plant matter is exposed to oxygen. Think about apples- when you cut them up and leave them, they are exposed to oxygen and turn brown. The same happens to juices- if you don’t drink them immediately, they oxidize and change flavor and nutritional value. A slower speed juicer such as a masticating juicer means that the produce is exposed to less oxygen during the juicing process. There are two types of masticating juicers: single auger or twin-gear dual stage masticating juicers. An auger is also referred to as a gear, so a twin-gear masticating juicer means that it has two augers, therefore there are two stages to the juicing process.